Silbury Hill is a large manmade hill that is by the side of the A4 near Avebury . 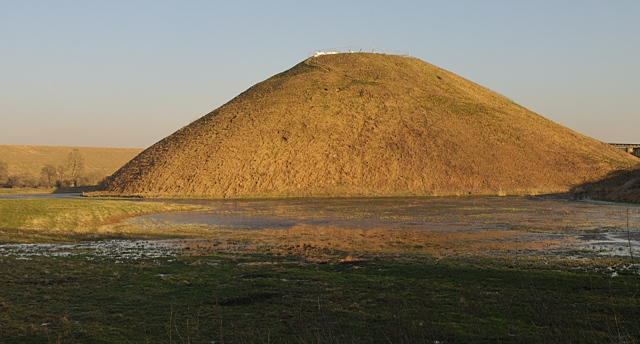 At 130ft (40 metres) high it is the largest prehistoric manmade mound in Europe, and one of the worlds largest. Archaeologist estimated that there was 18 million man hours of work involved in its construction, the equivalent of 500 men working for 15 years. Its made up of 8.75 million square feet of material. The base of the hill is 550ft, (167 metres) in diameter, and the summit has a plateau 10ft or 30 metres across. The first phase material has been carbon dated to 2,750BC. A site was chosen for Silbury Hill that had a natural projection, and by cutting this off from the hillside and building on it, initially a small mound, this site was started, it was later greatly expanded. The first phase consisted of a gravel core with a riveting kerb of stakes and Sarsen boulders. Alternate layers of chalk rubble and earth were placed on top of this. The second phase involved heaping further chalk on top of the core, using material excavated from an encircling ditch. At some stage during this process the ditch was backfilled and work was concentrated on increasing the size of the mound to its present height using material from elsewhere. In the winter, the low-lying wide ditch area around it fills with water so that it is only joined to the land by a strip connecting to the road. Some think there is a spiral running up the side, you have this with some other hills, and it may have been a way to process or get to the top or it may have had some other significance. It also may have been a part of the construction allowing materials to be taken up. With the surviving steps near the top, if you follow the route around the hill you return to a position a few feet up or down suggesting these are the remains of a spiral. No one knows what its purpose was. As so much labour went onto creating it, we can assume it had some real significancew or use. Some suggest that there is another form of energy, loosely based upon magnetic energies in the earth, that was the basis of a lot of the ancient monuments and shaping of the land. There is some evidence to support some of this with large underground containers constructed in some places, rings of magnetic stones at Stanton Drew in Somerset. The magnetic power the earth had then was many times what it is today, and the suggestion is that the knowledge of this energy form and how to use it has been lost. See also The discussion on the purpose of stone circles. Over the years there have been many theories from it being a grave, but numerous excavations that nearly destroyed it, found nothing of consequence in it. Some have noted that there are a number of alignments between high hills where the steps cut into Silbury Hill near its top, line up with other hill heights, and that Silbury Hill is visible from many directions except when crops are ready to harvest. Another theory is that it was a giant sundial. In 2000 a large hole appeared in the top of the hill, and emergency work was needed, English Heritage at the same time decided to do a more thorough investigation and renovation exercise. You can read all about this and their findings at www.english-heritage.org.uk/server/show/category.8613 and a number of linked pages and reports. English Heritage have another review of the hill and surrounding landscape at www.english-heritage.org.uk/server/show/category.1257, this also mentions a number of platforms around the area that may have had a use connected with the hill. In March 2007, English Heritage announced that a Roman village the size of 24 football pitches had been found at the foot of Silbury Hill. It contained regularly laid out streets and houses. As most Roman settlements were based upon or near existing major administrative centres, it seems likely that there was a sizable population somewhere very near to here at and prior to that time, that today we are unaware of. There is evidence of an extensive historic field system around Avebury that suggests it had a very high population in far earlier times. So while today its a large mound in the middle of the countryside, this could well have been the centre of society at that time. To put so much effort into its creation it must have had a significant role. West Kennet Long Barrow is just across the road (and a couple of fields). Getting there: On the A4 between Marlborough and Avebury. Access: Car park of the A4, or path from Avebury. You probably cannot go onto the hill itself, you were able to until the renovation work was done but since I don't think you can. Notes: You are no longer allowed to climb Silbury Hill, but you can see it from many directions.